Because my life was so chaotic this spring, I missed my book club for only the second time ever since it started 3.5 years ago. So I didn’t have a hand in choosing this book and when I saw the selection, I took one look at the cover and went, this looks like a book I’m not going to like very much. In general, I don’t really like women’s fiction. Anything that starts with so-and-so’s marriage has fallen apart and I’m out of there. I don’t really like books that primarily focus on relationships. It’s fine if there’s a romance in a book I’m reading, but I almost never enjoy books where the romantic relationship is the central focus. Weird, right? So this book had two strikes against it: the cover, which immediately made me think this was one of those chick lit books and the back cover description, which confirmed it for me. But. Surprise! I actually liked this one. Don’t judge a book by its cover, right? I liked the concept going in of the book club and the books that matter most and I was happy to see how it played out over the course of the book. It got me thinking (of course) about the book(s) that matters most to me. And I’m not sure I have an answer for that. Not yet. I mentioned before that I’m closing in on 1,000 books logged on Goodreads. So, I’ll probably save my judgment about what book actually mattered (or matters) most to me until then. I really liked the writing style of this one. Really liked it. 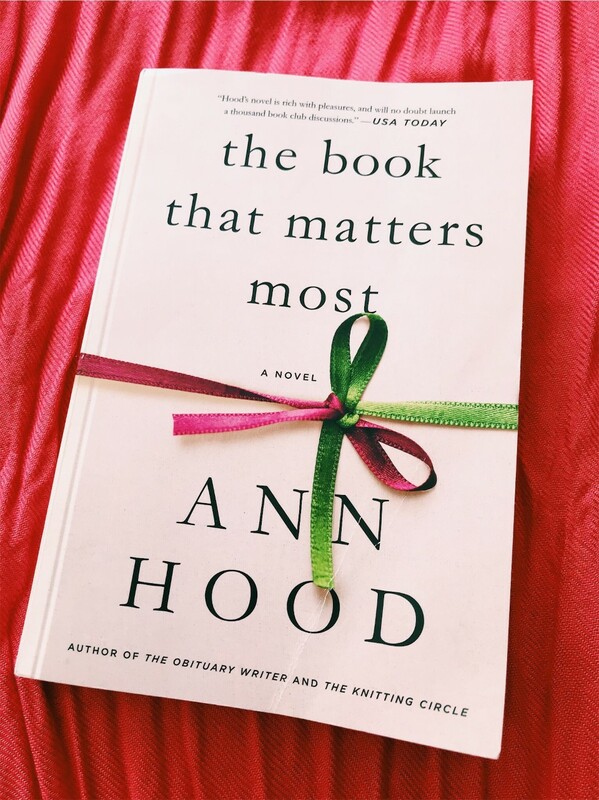 So much so that I think I may check out some other books by Ann Hood. Has anyone read anything by her? What do you recommend? Anything you think I’d like? Though I did enjoy it, I still would put this book into the category of a beach read or vacation book. It entertained me. It didn’t move me to tears or break my heart or anything like that. But I enjoyed the story and can confirm that I definitely misjudged this one. And, if you are a person who actually likes women’s fiction and chick lit, I’m sure you will love this one!